Dragon’s Cauldron is a group of Witches who work magic in the Reclaiming Tradition, serving the Durham-Chapel Hill-Raleigh area of central North Carolina. We are a friendly, committed group of men and women who honor the eight sabbats with ritual, offer our services in our community, and get together for fun, study and fellowship. We welcome all newcomers who have completed the Reclaiming introductory class, Elements of Magic. Witchcraft is a spiritual tradition that is based on remembering and recreating an earth-based way of life. 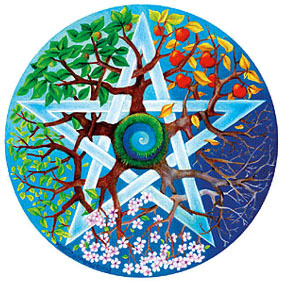 Witches honor the cycles of nature, the earth and the Goddesses and Gods that live within each of us. Working magic in the Reclaiming tradition means that we are part of an ever-evolving tradition of Witchcraft that is rooted in Eco-feminism and the Feri Tradition. It is a tradition dedicated to personal empowerment, to teaching, and to unifying spirit and politics. 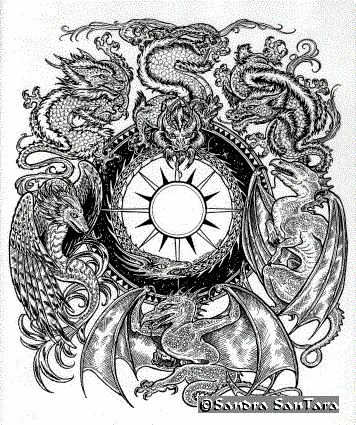 Dragon’s Cauldron embraces the ideas articulated in Reclaiming’s Principles of Unity. We connect with the earth as a living entity and recognize all life as sacred. As we perceive the Goddess, the Gods, as immanent, embodied in the cycles of life, so too do we understand ourselves as embodiments of the divine. We recognize that each person’s ultimate spiritual authority lies within, and as such we strive to know ourselves in all of our parts. We honor both the Goddess and the God, remembering that in mystery, the divine need not settle to a particular form. We celebrate diversity and welcome all genders, races and sexual orientations; and all those differences of life situations, backgrounds, and ability. We do not have a hierarchical system of High Priests and Priestesses, but instead encourage a shared power environment in which all participants may engage as they feel called. Because we require all attendees at our private rituals to have completed the Elements of Magic course work, we view all as equally qualified to lead and participate. Our ritual style emphasizes inspiration and experimentation and we embrace unscripted, improvisational, spontaneous, and ecstatic participation. Our tradition honors the wild, and calls for service to the earth and the community. Our spirituality sees all systems of oppression as interrelated, rooted in structures of dominance and control. Therefore, we work for all forms of justice: environmental, social, political, racial, gender, and economic. All events are clean and sober; please — no drugs or alcohol. For further information on Dragon’s Cauldron, contact us.